Mother and daughter Shihoko Ura and Elizabeth McClelland, founders of the blog Chopstick Chronicles, reveal the key to amazing Japanese cooking--fermenting your own miso, amazake and more. Sweet, salty, tangy and rich, these ingredients add subtle layers of flavor to dishes like Ultimate Miso Ramen, Vibrant Rainbow Roll Sushi and Japanese Curry with Summer Vegetables and Natto. It's easy to enjoy the health benefits of fermented foods, known for aiding digestion and boosting the immune system, with fun recipes like Amazake Bubble Tea and Super Simple Shio Koji-Pickled Cucumbers. 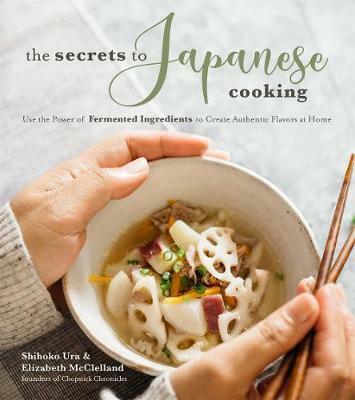 "Fermented foods play an integral part in the Japanese pantry, and in their debut book, the pair behind Chopstick Chronicles explores the funky flavorful world of fermented foods through tantalizing recipes and stunning photography." "Japanese food for everyday home cooks, with recipes that will make your taste buds sing!" "This collection of dishes not only brings you back to the roots of Japanese cuisine, but also introduces you to modern Japanese home cooking."